Some reading for you after a long day of Black Friday shopping. Coach Jim Larranaga most certainly knows talent and is one of the best teachers in the business. This fall, Larranaga and his staff signed five excellent recruits who appear to have the talent to match that of the Patriots' 2005-06 dream team, which knocked off North Carolina and No. 1-rated Connecticut to advance to the 2006 NCAA Final Four. The chances that any team would repeat such a miraculous season are unlikely. 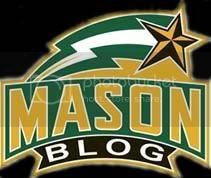 But George Mason again should be one of the nation's elite mid-major programs and a dangerous team for high-majors to play. Prominent among the newcomers is powerful athlete C/F Johnnie Williams (Eads, Tenn./Briarcrest Christian), a player who has the potential and intensity to become a future Will Thomas-type performer for Larranaga. Also signing were rugged 6-foot-7 PF Paris Bennett (Elizabeth, N.J./St. Patrick), textbook shooter and postgraduate wing Luke Hancock (Chatham, Va./Hargrave Military Academy), SG Rashad Whack (Forestville, Md./Bishop McNamara) and highly regarded Texas floor leader Vertrail Vaughns (Mesquite, Texas)." I'm a Hofstra guy but how I love me some Patriot basketball.